The Top 5 Toys to Avoid – Speechcenter, Inc.
One of the most common questions I receive from parents is “What toys can I buy for my child?” in relation to developing their speech and language skills. As parent, grandparent, aunt, uncle, or even a family friend, it can be overwhelming to walk into a toy a store or glance online at the myriad toys available to children these days. Toys can light up, spin, twirl, and promise a multitude of results all the way from teaching your child their ABCs to turning them into a brilliant mathematician. I want to break down some common toys available and why they may or may not deliver on their promises. The focus of this article will be on younger childhood, ages 2-5, but the same principles apply to older children. This toy promises to teach animals, animal noises, ABCs, songs, and shapes. Do you think it will wash my car too? (No seriously, my car needs to be washed). Most families that I work with will own one or two of these types of toys and I have never seen a child learn all of the things this toy promises to teach. Now, if a parent is busy, this can occupy your child’s hands and mind for a few minutes. If it’s more than 10 minutes you will simply want to throw up your hands, take out the batteries, and hide all the batteries after hearing a cow moo for the hundredth time! While you can point out the animals and talk about them with your child, I typically find that children just can’t stop themselves from pushing all the buttons to listen to you long enough. It’s hard to develop any interaction, the basic precursor to good communication, with these types of toys. I would recommend saving your money to invest in high quality toys that can grow with your child for many years. These toys always end up in yard sales and thrift stores for a reason. I know many of us are guilty for using tablets, or the television, to keep the attention of a squirmy little one. From a speech and language standpoint, tablets are not good tools for early childhood development. There are no magic apps that will teach skills such as turn taking, labeling of objects, following directions, and combining words. This does not mean that you under no circumstances should not purchase one for your child, however, it will typically only teach children how to work technology. While this is a viable skill in today’s ever expanding world, it will not help a child communicate their basic wants and needs and interact with the world. There is a growing base of research that correlates increased screen time with greater delays in speech and language. So, pull out the tablet in times of need or to watch a movie, but do not expect the tablet to teach necessary speech or language skills to a developing toddler. So, I know, this isn’t technically a “toy”. However, I do know how tempting it is buy flashcards when your child’s speech therapist says that your child needs to increase their vocabulary and label things in their environment. Even I have used flashcards from time to time. Save your money though as more and more research is indicating that labeling flashcards out of context is not functional for young children. Children need exposure to items they see everyday and naming flashcards won’t often be enough for them. While these may be appropriate for older children in specific cases, I no longer use them with my younger population. At first glance you might think ‘what’s wrong with this toy?’. It teaches 4 different basic shapes, you can change the face and make emotions, you can push the feet. Now I want you to think: how many large plastic toys are in your household that teach basic shapes, have 3-5 pieces, and each need a place for storage? From an educational standpoint, you could teach shapes with this toy, but that is not developmentally appropriate for most young children. Development needs to be about exploring your environment and interacting with others. Children can learn emotions from looking in the mirror, reading a story, or acting out emotions for play. At face value, this seems like a toy that would enhance your child’s play but ultimately throw it out! You would be better off buying a bigger set of blocks with different shapes or a large puzzle when your child is older. By the time they are 4 or 5, when they should be learning their shapes, they will have significantly out grown the above toy. Another plastic toy that makes sound- see a theme? This type of toy is not without value. You can teach your child to label the animals and to say the sound with you. I even have fond memories of playing with one as a child, however, that memory is coupled with spending the day at my grandparents and has more to do with my time there than the specific toy. There are other ways to teach animals and animal sounds without purchasing a toy like this one. It will only take up room in your house and your child will quickly outgrow it. I guarantee it will find its way to the ‘give away’ pile within a year. I almost forgot the most important component to play and learning: YOU! THE PARENT! Whatever you choose to purchase for you child, make sure you are somehow involved in their play. Children learn best from their parents. Even if it feels silly or different, get on the floor and put yourself on your child’s level while providing a good model of play and learning skills. This will offer the more than any toy ever could. 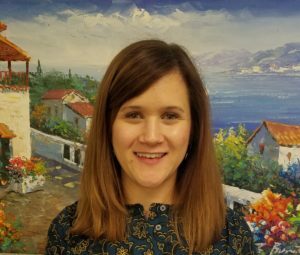 Natalie is a speech language pathologist who is currently employed at Speechcenter Inc. Natalie holds a BA in Psychology from UNC-Chapel Hill and a MS in Communication Sciences and Disorders from ECU. She has had extensive experience working in early intervention with toddlers, preschool aged patients, and school-aged children.